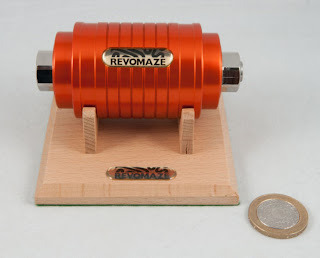 Way back in the mists of time there was a competition to design a new Revomaze puzzle. 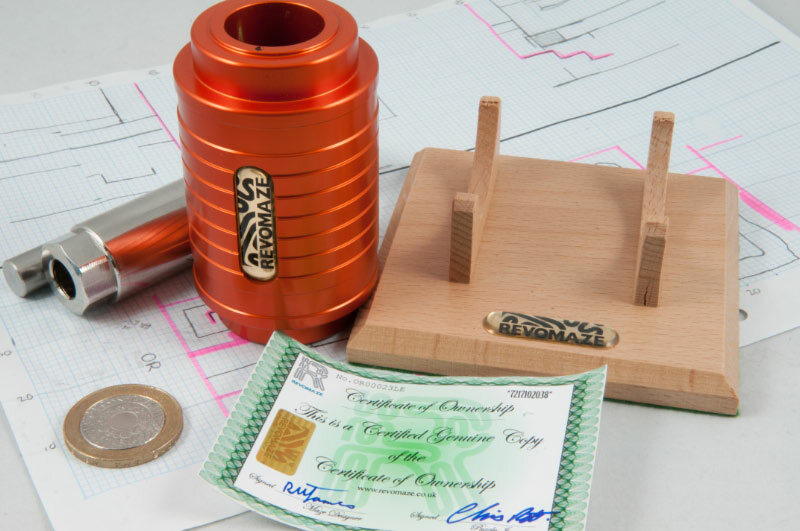 The competition was open to pretty much anyone who’d solved at least one of the puzzles in the range (so that you know how they work, essentially) and quite a few folks took up the challenge and submitted a design or two. I think it’s fair to say that not all folks who are able to solve puzzles would necessarily make half-decent puzzle designers – and in fact a couple of the entries were delightful in their total disregard for any need to actually be capable of being manufactured, dismissing their little impossibilities with a casual remark intended to pass across any responsibility for implementing these features to Chris Pitt, the originator of the puzzles and runner-of-the-competition – “Place anti-matter device here facing left/right” – not quite, but you get the general idea. Chris gave feedback on the entries he was receiving from time to time and at one stage let it be known that there was a definite favourite in the pile. The eventual winner was judged by a bunch of Revomaze-junkies, or serious puzzlers as I expect they’d prefer to be known, and the result was totally unanimous, albeit not the entry that Chris had thought was the front-runner. 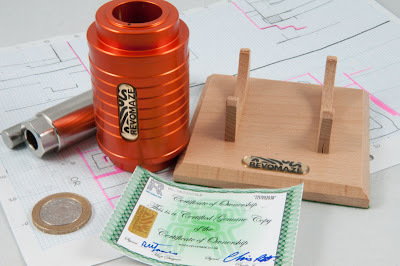 Having selected the winner there was the inevitable delay while the design was ‘improved’ (read: made even harder!) 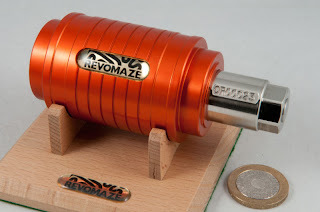 and the manufacturing logistics were sorted out and then about a year after we’d all signed up for one, the Orange Revomazes began arriving through the mail. Designed by Mark (mark76 on the forums) who’s previously been noted in dispatches for making mini and micro Revomaze puzzles and even giving some of them to arbitrary puzzle bloggers [Thanks mate], the Orange design seriously shows off not only his incredible skills with some fairly simple (his words) PC design software, but also his creativity in coming up with a puzzle that actually tells a story along the way as it winds through six or seven distinct phases of the solution. Having opened mine and reading some of he back-story that Mark’s published on the forum, I can see why it was the unanimous choice of the puzzlers choosing the winner. My Orange puzzle arrived during December at just about the same time as the family descended for Christmas and I took some time off work to spend with them – so it took a week or so before I had even taken it out the box, and then several more weeks until I had actually found much time to work on it – and I have to say that I rather enjoyed getting back into the old routine of measuring and mapping and trialling and erroring. This is a genuine old-school Revomaze – and a good mechanical puzzle – everything is there in your hands and lovers of the earlier Revomazes will definitely enjoy this one as well. On the outside, it looks just like any other Revomaze, with the colour of the sleeve being the only nod to what’s inside. Once you drop into the maze for the first time, you’ll know it’s different – there are traps everywhere, and negotiating a path around them is quite a tricky task, with several spots that will stop any agricultural attempts at solving it, futile. Wind your way through the first two parts (the village and the forest) and you find yourself confronted by “the guard” – and getting past him can take quite a while, especially since Chris tweaked something in there to make it’s behaviour rather unusual, until you work out how to control it properly – then it behaves rather well (and seeing that little piece of evil for the first time is a real eye-opener!). Mark has used the space incredibly well and re-uses bits in an almost impossible fashion. The guard is a masterpiece of evil and I’m not surprised that it manages to keep people at bay for hours / days at a time. I suspect that given the opportunity to test the puzzle a bit more before they wound up production and unleashed it on the public desperate for another Revomaze, a couple of potential short-cuts (including one that I made use of) could have been designed out, creating an even more phenomenal puzzle – as it stands it’s a great puzzle though and probably has been rightly characterised as somewhere between the Bronze and the Silver Revomaze in terms of complexity. Definitely not a puzzle for the faint-hearted or the casually interested puzzler – you either get totally sucked-in and respect this puzzle, or you fail miserably – your choice! Fantastic design Mark! You definitely hit the sweet-spot of a puzzle that demands concentration without making one that requires months of slogging. Thanks mate – and by the way, my hands still hurt! Just opened my orange today. It's a phenomenal puzzle - my favourite so far! Nice review, thanks. I like your use of imagery; forest, castle, moat etc...you really make it sound like an adventure and giving the feeling that the maze is really a huge expanse of area with lots to cover! Good to see a little teaser of a map. I am still working on the blue just now but good to see my mapping may be on the right track. I have the bronzeV2 and Orange waiting to be tackled. Which would you suggest to try after the blue? Great review Allard! I really enjoyed this puzzle as well. I think I saw that potential shortcut when I looked at the core. However, it looked as if a small area had been filed off. I wonder if Chris became aware of this shortcut and corrected it on later runs. Just ordered my Orange and look forward to it! Can anyone tell me, what the opening time is? How many hours are spent solving this puzzle? That will depend HEAVILY on how many others you've opened... could be 5 or 10 hours, could be hundreds.